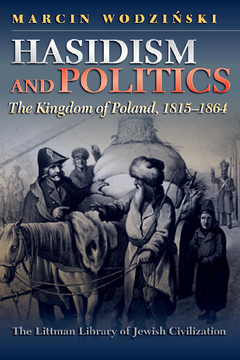 Analysing the political relations between the Kingdom of Poland and the hasidic movement, this book examines plans formulated by the government and by groups close to government circles regarding hasidim, and describes how a hasidic body politic developed in response. Marcin Wodzinski demonstrates that the rise of hasidism was an important factor in shaping the Jewish policy of both central and provincial authorities and shows how the creation of socio-political conditions that were advantageous to the hasidic movement accelerated its growth. While concentrating on the dynamic that developed in the Kingdom of Poland, the discussion is informed by a consideration of the relationship between the state and the hasidic movement from its inception in the Polish - Lithuanian Commonwealth. The novelty of this study lies in the fact that, whereas most analyses of political culture concentrate on states and societies with well-established electoral systems of representation, Wodzinski focuses on the under-researched area of political relations between a non-democratic state and a low-status community lacking authorized representation. Applying concepts more often associated with cultural history, his analysis draws a distinction between the terms of reference of high-level political debate and the actual implementation of policy middle- and low-level officials. Similarly, in analysing hasidic responses he differentiates between high-level hasidic representations in the state and the grassroots politics of the community. This combination enables a broad contextualization of the whole subject, integrating the social and cultural history of Polish Jewry with that of Polish society in general. 4. Measures: What are ‘Civil Christians’? 5. What Does ‘To Civilize’ Mean? 3. How Did a Maskilic Shtadlan Differ from a Hasidic One?